A recent example of where the building team successfully optimized the use of steel is the Seattle Central Library, which features a steel diagrid facade. In addition to presenting a unique, eye-catching exterior, the structural steel also serves as the facade support and the exposed lateral load resisting system, resisting wind and earthquake forces. In addition, it is part of the building’s shading strategy. 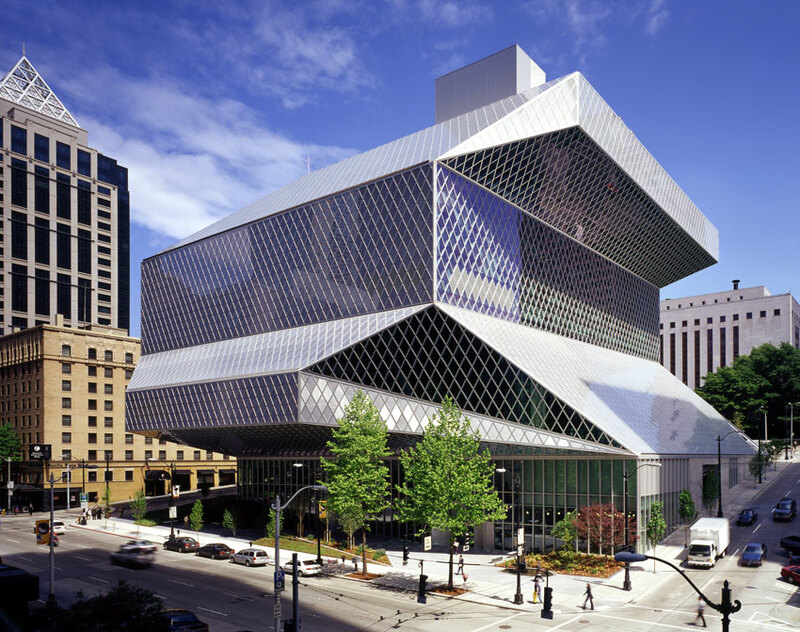 For the Seattle Central Library, Magnusson Klemencic Associates designed the structural steel system to serve four purposes: the facade support, shading strategy, exposed lateral load resisting system, and an attractive aesthetic. According to Davis, 90 percent of the aluminum that would typically go into a facade mullion system was eliminated because the steel diagrid is doing that work directly. 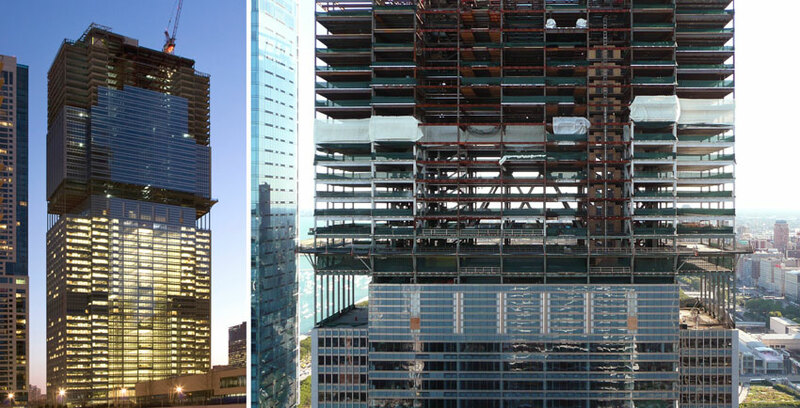 MKA was also involved with Chicago’s Blue Cross Blue Shield tower expansion. The original design of the building anticipated a future vertical expansion, but when the decision was made to proceed with the expansion, it was discovered that the concrete core was significantly off plumb and the original planned expansion was not possible. For Chicago’s Blue Cross Blue Shield’s vertical expansion, Magnusson Klemencic Associates designed new steel transfer trusses on the original roof, which was originally designed to support reserve vertical load capacity. In these construction photos, it’s possible to see the transfer trusses between the original structure and the new expansion. Fortunately, the original design incorporated a steel frame with reserve vertical load capacity and accessible steel column connection points that allowed the use of a structural steel braced frame system for the vertical expansion that minimized loads. In designing new steel transfer trusses on the original roof, this created both an efficient transition to the tower above and an integrated MEP floor with open program spaces between the trusses, explains Davies. Similarly, a central atrium in the original tower was thoughtfully designed for future elevators and accessible steel framing for attaching new guide rails. This essentially enabled the original building to be occupied outside the atrium during the new construction. 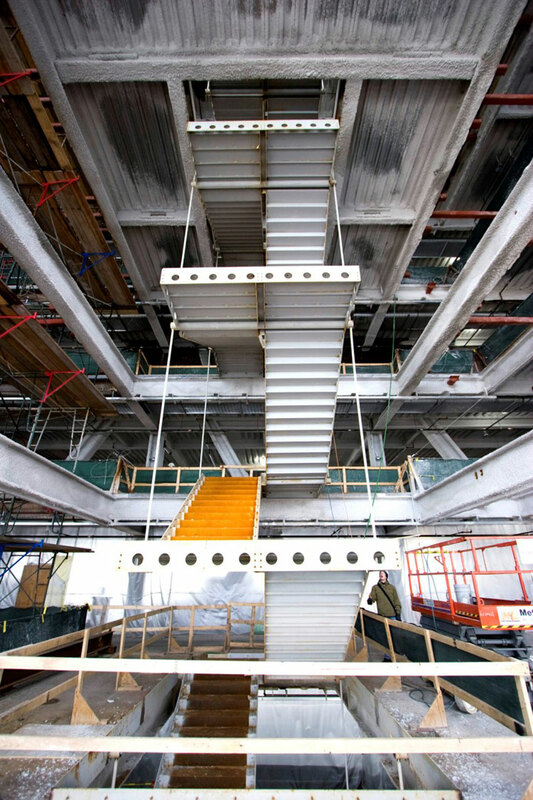 Pictured is the interior steel stairway hanging from the new construction above Blue Cross Blue Shield’s vertical expansion. Another example where early involvement with the steel fabricator led to significant savings is MKA’s design for the Frank Gehry Experience Music project in Seattle, which involved an extensive use of plate steel cut to customized shapes. MKA’s design for the Frank Gehry Experience Music project features a steel rib cage, with each rib fabricated in a unique custom shape. Looking for a way to minimize waste, the fabricator came up with an innovative solution utilizing software from the garment and shoe industry that optimized cutting different shapes out of a flat surface with minimal waste. Here the ribs are being welded and laid out in the shop, capitalizing on a software tool from the garment industry. Clearly proving the benefits of the fabricator’s early involvement is the recent Mercy Heart and Vascular Center at the St. Vincent Medical Center project in Toledo, Ohio. The original design-bid-build project delivery model without fabricator input resulted in an over-budget project with a steel package valued at $2.8 million for 910 tons of structural steel. After transitioning to a design-build model that included the steel fabricator on the project team, the steel package was reduced to 772 tons at a cost of $2.35 million, with no change to the owner’s building program. As the producer of a highly sustainable, multi-attribute building material, the structural steel industry has a proven track record and continues to stride toward further reducing the material’s environmental footprint. Since 1990, the industry has posted an overall reduction of greenhouse gas and other emissions of 36 percent, while increasing the average strength of structural steel sections by 40 percent. Similarly, major improvements in mill technology have produced a reduction of the man-hours required to produce a ton of steel from 12 hours per ton in the 1970s to 0.6 man-hours per ton in 2016. Structural steel is truly a cradle-to-cradle, multi-attribute sustainable material. The AISC Steel Solutions Center provides a wide range of technical information and support services for building teams, including information on the sustainable attributes of structural steel. To learn more about structural steel and sustainability, the Steel Solutions Center can be reached at 1-866-ASK-AISC or solutions@aisc.org. 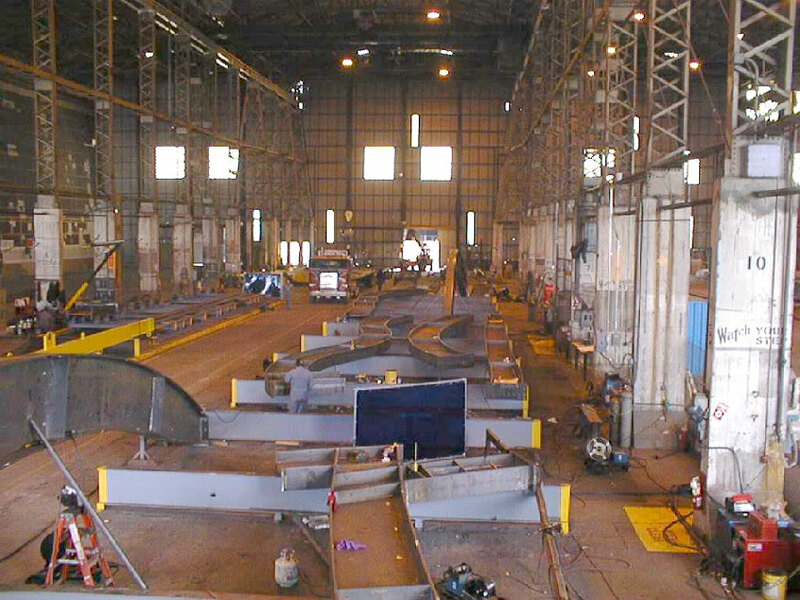 Environmental Product Declarations for fabricated hot-rolled structural sections, fabricated steel plate, and fabricated hollow structural sections (HSS) can be found at www.aisc.org/epd. An annotated graphic of the cradle-to-cradle life cycle of structural steel can be downloaded at www.aisc.org/cradletocradle. Articles dealing with structural steel and sustainability as well as case studies of sustainable projects can be found at www.aisc.org/sustainability. But the best resource to minimize the environmental impacts for structural steel projects is a local structural steel fabricator who can discuss the optimization of the structural framing system. A list of structural steel fabricators, searchable by location, can be found at www.aisc.org/fabricator. Barbara Horwitz-Bennett is a trade press journalist who has covered the design and building industry for the past 17 years. She contributes regularly to a number of leading architectural publications. AISC is the leading advocate and trusted resource for American structural steel. Grounded in unsurpassed science, quality, and craftsmanship, our vibrant industry is ever-advancing and ever-improving. That’s why for nearly 100 years, AISC has proudly innovated with breakthrough research and applied technology for fabricators, engineers, architects, and the construction industry. We set the standard so you can focus on delivering visionary projects of the highest quality for your clients. As we move into our next 100 years, we’ll continue to advocate for, champion, and strengthen this vital industry. solutions@aisc.org.